You have to put in a song that makes you happy. You can tag as many people as you like, there is no limit. 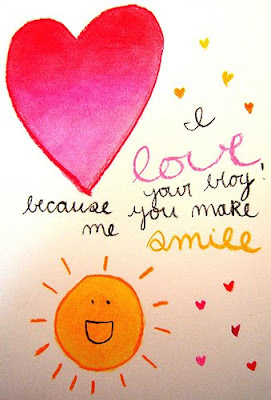 Say at least one thing about each blog you tag, that will make them smile, something nice about their blog that makes you smile when you read it! ok the song i'm choosing is "A Little Respect" by Erasure. it's one of those that gets stuck in your head until you feel like you want to literally smash your head on a desk or something (wow graphic sry) but for some reason, i LOVE this song. it makes me laugh and smile. i liked it even before they featured it on an episode of Scrubs, which is where the video below is from. she does amazing things with her face and hair, stuff that have always had an urge to do but dont think i would ever have the guts to do. she does awesome tutorials as well, go check them out! i also looooved the post with the different pictures of the hair changes she's gone thru. and she does polish photos, so bonus! i know, i know, i've sung liz's praises many times, but i'm doing it again cuz she's THAT cool. i love her sense of humor! totally smile when i go to her blog page. she has an infectious grin in her profile picture and she's such a doll! i love how she ties in her polishes with a picture or an object. very fun and very smile worthy. i am a recent reader of her blog, but am so happy to have found it. we have so much in common and we're both avid bargain hunters but won't sacrifice our style haha! i loved reading her reviews and it's so great to have a little forum on her "wednesday question" posts. she's a sweetie-pea!